Earth Faerie Momma: Every Day Should Be Earth Day! Today, April 22, is officially Earth Day. But do you know how it all began? After seeing a distructive oil spill in 1969, Gaylord Nelson, a U.S. Senator of Wisconsin, was inspired to start a movement. In 1970 he brought together over 20 million people for an environmental teach-in on April 22. This day is now called Earth Day and is celebrated by several countries all over the world. 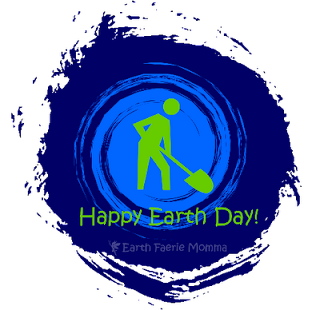 In our house we celebrate the earth every day. We are slowly making changes to be even more environmentally friendly. I make the majority of our cleaners. We eat organic when possible. We have cut down on paper products and try not to waste water. We use cloth diapers and wipes. We use non-toxic products and support companies with these same values. Of course, I wish we could do more. Sometimes money is a factor for us. That is why it is a slow process. Start up costs can be hard to overlook but they really are worth it! I realized that while using cloth diaper. So we now use handkerchiefs, unpaper towels and cloth wipes. How is your family environmentally friendly? What would you like to change and what is stopping you?